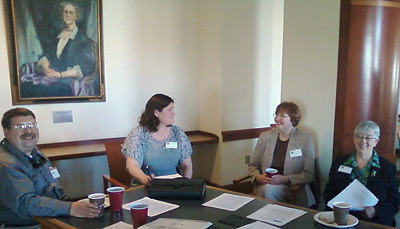 CCML members at a 2011 meeting at the University of Colorado Anschutz Medical Campus, Health Sciences Library. To optimize cooperation among CCML members. To strengthen affiliations between CCML and related groups. To respond to the educational and professional needs of CCML members. To enhance CCML's organizational structure and to support its future growth. Meetings are held on a voluntary rotating basis in the various members' institutions. Meetings include Council business and an educational program on a library or health care topic. Past programs have covered medical information systems, consumer health, medical emergencies, and trends in health care marketing. How can I take advantage of my CCML membership? To learn more about the Colorado Council of Medical Librarians, check out our Membership page and all the different ways to get involved.